A stylish DL flat invitation printed on a thick textured white card stock called Performance White. 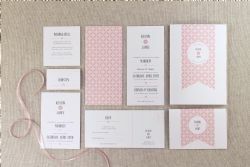 This invitations includes printing of a geometric graphic on the reverse of the invitation as well as matching graphic elements on the front of the card. Please note that the graphic elements can be altered to suit any colour scheme.